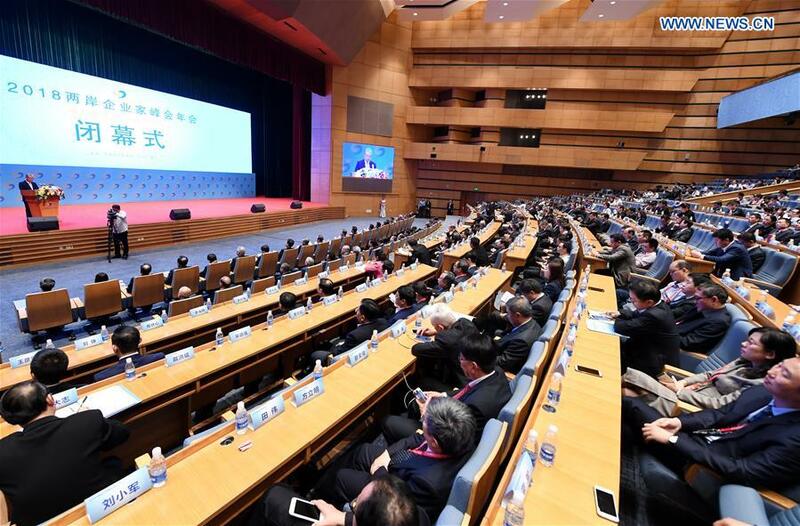 XIAMEN, Dec. 5 (Xinhua) -- The 2018 annual conference of the summit for entrepreneurs across the Taiwan Strait concluded Wednesday in Xiamen, east China's Fujian Province, with deals worth 10.3 billion yuan (about 1.5 billion U.S. dollars) signed. When addressing the conference Tuesday, Wang Yang, a member of the Standing Committee of the Political Bureau of the Communist Party of China Central Committee and chairman of the National Committee of the Chinese People's Political Consultative Conference, said that the Chinese mainland would only open wider and wider to Taiwan, with ever-improving policies and services. Themed around new measures for industrial integration and sharing new business opportunities, this year's conference gathered more than 1,000 cross-Strait entrepreneurs, heads of industrial and business groups and experts to pool ideas for exchange and cooperation. Guo Jinlong, president of the mainland-based council of the summit, said that cross-Strait entrepreneurs should help boost cross-Strait economic cooperation and industrial integration with practical actions. Vincent Siew, president of the Taiwan-based council of the summit, said that cross-Strait business cooperation would enter a new phase amid changes of global and cross-Strait economy, adding that entrepreneurs should contribute more to integrated cross-Strait economic development. Entrepreneurs attending the conference suggested that cross-Strait business circles should join hands to tackle new economic challenges, grasp new opportunities brought by cross-Strait economic integration development, and share new business opportunities. They also called on cross-Strait compatriots to work together to uphold the 1992 Consensus embodying the one-China principle and resolutely oppose and curb "Taiwan independence," and to create a sound environment for cross-Strait economic cooperation as well as contribute to the peaceful development of cross-Strait relations and the realization of the Chinese Dream of national rejuvenation.